Join us for this day program which includes a yoga class, lunch and guided tour of the grounds, including an overview of our environmental initiatives and gardens. 11-12:15 – Hatha Yoga class. Please come early to register at the gift shop where you will be directed to the classroom. We supply yoga mats and blankets. Children and adults are welcome. The class is open to all levels. 1:15-2:30 – Take a guided tour of our grounds, abundant gardens, environmentally designed buildings and devotional spaces. 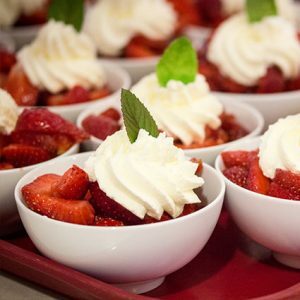 Join us for this program which includes a yoga class, lunch and guided tour of the grounds, plus participate in Karma Yoga (selfless service), dinner, evening satsang (devotional service). Includes overnight accommodation and Sunday breakfast. 7:30 – 8:30 pm Satsang. A spiritual service that includes ritual, mantra/meditation and an inspirational talk. $25/ ages 6 – 18. 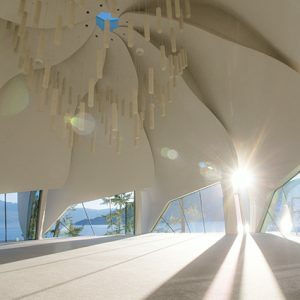 1:15-2:30 – Take a guided tour of our grounds, abundant gardens, environmentally designed buildings and devotional spaces, including the spectacular new Temple of Light. Dates: Click here for a list of upcoming dates*. *For travelers coming from within BC who are on Pacific Standard Time, including the Nelson area, please note that the Ashram is on Mountain Standard Time from November 5, 2017 – March 10, 2018. Mountain Standard Time (Alberta time) is one hour ahead of Pacific Time (BC time). From March 11, 2018 until November 5, 2018 the Ashram is on Pacific Standard Time. 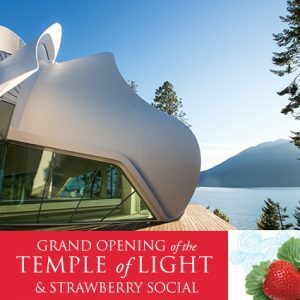 Welcome one and all to our 23rd annual Strawberry Social, this year featuring the public opening of the Temple of Light. Let’s celebrate the completion of this sacred space, which will serve the Ashram, the local community and pilgrims from around the world. 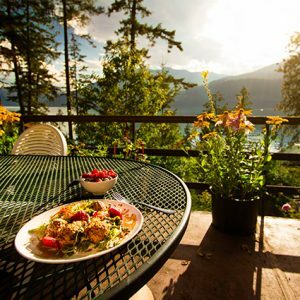 Come, enjoy Creston strawberries and visit one of the new wonders of the Kootenays! 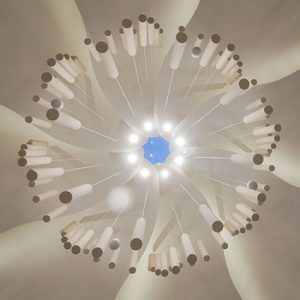 Join us in a contemplative gathering to dedicate the new Temple of Light. Together let’s celebrate the divine and human forces that unified to manifest this sacred space —including our worldwide community of love and support. Join us in saturating the Temple with devotion, sending out vibrations of peace to the world, and honouring our teachers and rich lineage of teachings.